NEW YORK, NY--(Marketwire - Sep 6, 2012) - Capitalizing on the unique nature of its home city, New York's Duane Reade chain has built its drugstore brand on uniqueness, with a tag line -- Uniquely New York since 1960 -- that speaks precisely to that point. So it is no surprise that the chain's newest store, located at 100 Broadway and overlooking the famous "Canyon of Heroes" tickertape parade route, is in a league of its own. Not only does the store's design speak to its historic site, but this new Duane Reade location also boasts the brand's first ever Upmarket Chop Salad Bar, where customers can create their own customizable salads. Duane Reade collaborated with agency partner CBX on the creation of the store-within-a-store (Upmarket) Chop Salad Bar, the newest offering for the chain's Upmarket brand. The fresh offerings at Upmarket Chop allow customers to customize their own salads in a "grab 'n go" manner that works conveniently with their hectic lunch hours. "Duane Reade continues to bring value to New York City shoppers, providing everything from pharmacy to fresh food needs," says Todd Maute, Partner, CBX. CBX helped create a distinctive look for Upmarket Chop, the centerpiece of which is a giant LED light box of a spoon, fork and knife that hangs on the wall of the salad bar. 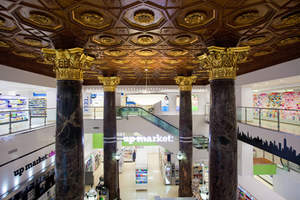 The rest of the store's design plays into its historic "Canyon of Heroes" location in an 1896 building that formerly housed the American Surety Company. The design features museum-like plaques on each of the nine columns facing Broadway that give a brief description and image of some of the athletes, presidents and war heroes that have been showered with streams of confetti in past parades. The design is fresh, fun and contemporary, with black laminate cubicle shelving, brushed aluminum lighting troughs, black and white subway tiles, an iconic NY skyline and playful framed phrases in the back wall cubicles. From the store's second floor, one can look down onto the famous Trinity Church and Cemetery, as well as get a perfect view of the "Canyon of Heroes" route. CBX is a brand agency specializing in corporate identity, consumer branding and retail. The company, with its current staff of 140, was founded in 2003 and has a client base that includes Del Monte, General Mills, Kimberly-Clark, A&P, Pathmark, Saks Fifth Avenue Off 5th, Lord and Taylor, Wawa, Sunoco, and PetroChina. In addition to its New York City headquarters, CBX has an office in Minneapolis, and through the CBX Worldwide Partnership, has operating offices in Santiago, Buenos Aires, Sao Paulo, Mexico City, Melbourne, Shanghai, London and Seoul. The firm was ranked #282 in the Advertising & Marketing industry for the 2011 Inc. 500/5000 list of fastest growing private companies. Founded in 1960, Duane Reade is the largest drug store chain in New York City. In keeping with the company's brand vision of New York Living Made Easy, Duane Reade provides New Yorkers with prescriptions, health products and services, beauty products and services, food and convenience items for daily life in the City... everything for "How I Feel," "How I Look," and "What I Need Now." The company operates 250+ stores throughout the metropolitan New York region. Duane Reade is part of the Walgreens family of companies, the nation's largest drugstore chain with more than 7,900 stores in all 50 states, the District of Columbia and Puerto Rico. NOTE TO EDITORS: Contact Christine Coppinger of CBX for additional photos. New store at 100 Broadway features Duane Reade's first Chop Salad Bar, the newest offering for the New York chain's Upmarket brand.